WINNERS: Perfume Polytechnic First Birthday Celebrations & Giveaway! Entries to this competition closed an hour ago, and I decided to get right on it and draw the winners! Congratulations to the winners and thanks to everyone for entering. 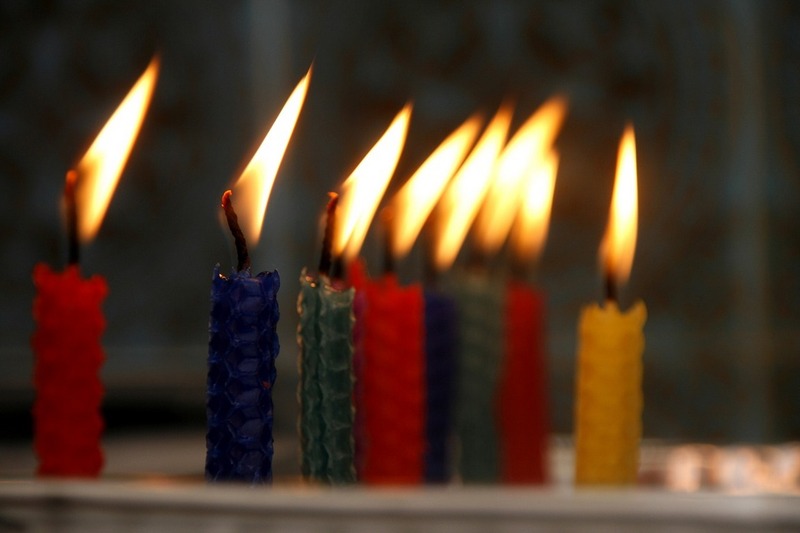 I had many lovely entries and you shared some wonderful childhood scent memories with me. I’ll publish a selection of those memories soon. Winners were chosen randomly today on random.org. 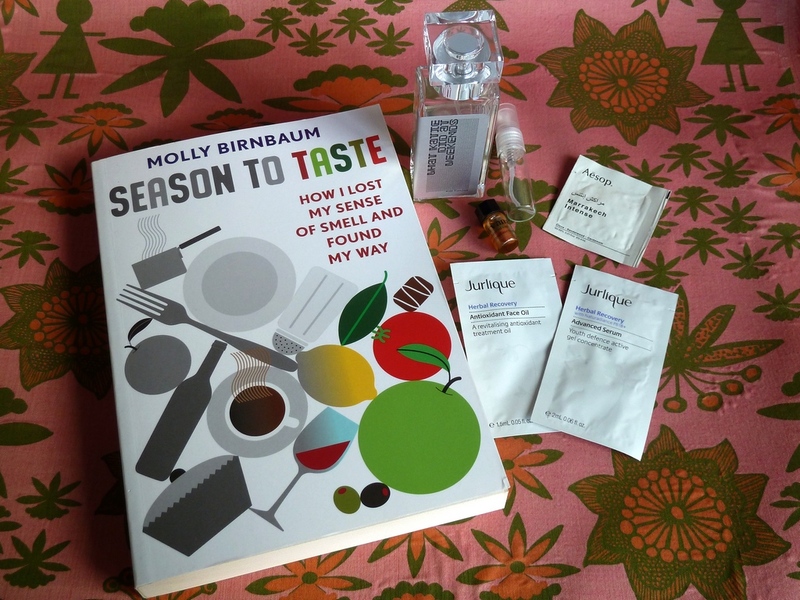 A copy of the book Season To Taste by Molly Birnbaum, a fascinating book by a woman who lost her sense of smell and wrote about her journey trying to find it again. PLUS: A 4ml decant of 4160Tuesdays’ discontinued and hard to find fragrance What Katie Did at Weekends. This is an older version of the now reworked What Katie Did on Friday Nights, recently renamed Fruits of the Tree of Knowledge. Bottle of fragrance is included in the photo for illustrative purposes; you will receive a 4ml decant only, as pictured next to the bottle. PLUS: A 1ml sample of Evocative Perfumes’ newest release Nirvana, a fabulous oud fragrance which I will review in the next day or two, and which you should absolutely want to try! This sample has very generously been provided by Mark Evans, perfumer at Evocative Perfumes. Bless him. 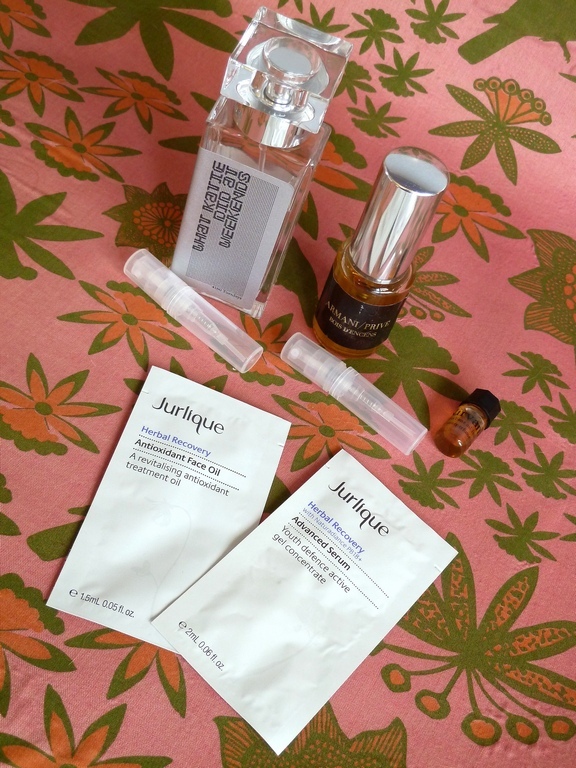 PLUS: Samples of products from Australian skin care brand Jurlique, and a sachet sample of Marrakech Intense fragrance, the 2014, revamped version of Marrakech from Aesop, another iconic Australian skin care label. Includes free shipping anywhere in the world. Perfume Polytechnic cannot accept responsibility for customs duties or fees accrued in your country, or for lost or damaged items. A 1.8ml sample of 4160Tuesdays discontinued and hard to find fragrance What Katie Did at Weekends. This is an older version of the now reworked What Katie Did on Friday Nights, recently renamed Fruits of the Tree of Knowledge. Bottle of fragrance is included in the photo for illustrative purposes, you will receive a 1.8ml sample only, as pictured next to the bottle. PLUS: A 1ml sample of Evocative Perfumes’ newest release Nirvana, a fabulous oud fragrance which I will review in the next day or two. This sample has very generously been provided by Mark Evans, perfumer at Evocative Perfumes. Thank you Mark. PLUS: A 1.8ml sample of Armani Privé’s Bois d’Encens. Bottle of fragrance is included in the photo for illustrative purposes, you will receive a 1.8ml sample only, as pictured next to the bottle. Includes free shipping anywhere in Australia. Perfume Polytechnic cannot accept responsibility for lost or damaged items. Prizes will be redrawn if winners do not respond within 7 days. A reminder about our wonderful birthday giveaway, which ends this coming Wednesday at 5pm, AEST (that’s Melbourne/Sydney time). All followers/subscribers to Perfume Polytechnic are welcome to enter! These prizes reflect some of the themes, topics and perfumers that have been explored here at Perfume Polytechnic. Included are indie perfumes by Sarah McCartney of 4160Tuesdays and Mark Evans of Evocative Perfumes, both of whom have been interviewed here. Australian products and samples are included so that I can share a little bit of my home country with those of you overseas. And the book Season To Taste is about the science of smell, taste and olfaction, areas that have been covered in some depth here. There are two prizes: Prize no. 1 is open to anyone in the world (including Australia), including shipping and handling costs. Prize no. 2 will ship within Australia only, as a way of saying thanks to my Australian audience, and because Australians often miss out on giveaways and prizes. Entry is open to all followers of Perfume Polytechnic. Tell me how you follow Perfume Polytechnic (e.g. by email or WordPress). If you don’t already follow Perfume Polytechnic, you are welcome to do so to enter the competition. Instructions on how to follow the blog can be found here. Note: The profile name or email used that you use to leave the comment below must match the profile name or email that you used when you signed up to the blog. This is so I can confirm that you follow. Tell me which country you come from, so I can sort my entries to select the two prizes. Note: If you cannot see the comments box, click on the heading/title of this post, scroll to the very bottom of the page, and it will appear. Competition closes Wednesday the 23rd September at 5pm AEST. I will draw two winners using random.org on the 24th September, will announce the winners here and on Facebook, and will try to contact you privately through email, your Gravatar, or Facebook. Prizes will be redrawn if winners do not respond within 7 days. Perfume Polytechnic First Birthday Celebrations & Giveaway! Perfume Polytechnic turns one today! Perfume Polytechnic is an Australian blog that explores perfume and olfaction, with a focus on research and sharing knowledge. I like to keep topics here intimate, small-scale and personal, meaning that the focus is on local and independent perfumers and their products, scent memories and personal olfactory experiences, such as smell walks. The creative side of life interests me too, and you can see that reflected here with posts about synaesthesia, olfactory art, fragrance ingredients and their method of extraction. I have delved deeply into the exciting new field of cooking with essential oils, literally exploring how perfume tastes. I’ve discussed gender, history, disease, sound, textiles, and animals, and how all of these things relate to smell. It’s been a really interesting year, and I feel myself itching to explore the world of olfaction deeper and further still. “Welcome to Perfume Polytechnic. I am a perfume enthusiast, creative, ex-academic and auto-didact. I love to learn about the things that interest me in great depth. Eighteen months into my fascination with perfume, I feel the need to expand my knowledge, to delve more deeply into a range of areas in the field of scent and olfactory art. I am not an expert in this area; I know a little, but not a lot. I do hope that you’ve enjoyed the journey so far. Perfume Polytechnic has many more posts and projects lined up for the future, including a deeper exploration into synaesthesia, olfactory art, more reviews of fabulous indie fragrances from around the world, and interviews with their makers. Perfume Polytechnic has an international following. As of today, readers from 115 countries have visited Perfume Polytechnic, with the highest numbers of views from (in the following order) the USA, Australia, the UK, Italy and Canada. I have interviewed 10 independent perfumers from Australia, the UK, the US, Italy and Switzerland. The most popular post on Perfume Polytechnic is Shalimar Showdown: The Originals and The Flankers Battle it Out with 803 views. To celebrate Perfume Polytechnic’s first birthday and to thank you all for visiting the blog over the past year, I’ve decided to give something back to you, my readers, supporters, muses and friends. These prizes are not random: they reflect some of the themes, topics and perfumers that have been explored here at Perfume Polytechnic. Included are indie perfumes by Sarah McCartney of 4160Tuesdays and Mark Evans of Evocative Perfumes, both of whom have been interviewed here. Australian products and samples are included so that I can share a little bit of my home country with those of you overseas. And the book Season To Taste is about the science of smell, taste and olfaction, areas that have been covered in some depth here. There are two prizes today: Prize no. 1 is open to anyone in the world, including shipping and handling costs. Prize no. 2 will ship within Australia only, as a way of saying thanks to my Australian audience, and because Australians often miss out on giveaways and prizes. For a bonus entry, visit my Facebook Page and follow the instructions on how to enter there.